I've finally beaten Ghentis. With a friend to supervise me and offer tactical advise, I beat him down with a team at lv 50-54, and a lv 44 Deino that acted as a turn holder while I healed others. And now that that's done, I have migrated every single Pokemon from Diamond and Soulsilver, and backed up the save data on my computer. Time consuming, as I had to remove all HMs from all Pokemon. With their levels and the last gym badge though, I'll be hard pressed to come across any problems from here on in. On another note, I've resolved to crack open the old Crystal game and recreate all the Pokemon I want to keep in Pokegen. Maybe later I'll be able to give them to myself. Slyveon looks like it would be a Normal type Pokeman, just for the lulz. Some might argue that Normal type would be disappointing, but it is not like Flareon was ever useful either (with the exception of the "using rage while transformed" glitch). Actually I never had any Eveelution in my main line-up, except for Vaporeon, and Umbreon in Pokeman: Gale of Darkness (oh gawd, the horror; had to exorcise all the Shadow pokeman since the shadow attacks were useless). 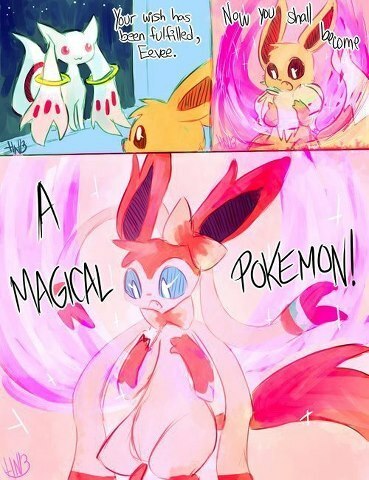 The method of evolving Eeevee into Sylveon has been revealed! Got your hopes up, didn't I? No, actually. As time continues, my opinion of Sylveon being a flying type manages to become stronger (I've been told that it looks like a kite, which pretty much seals the deal for me). But to make this post worth more than a simple opinion, I've come to appreciate how much of a challenge White version has become now that I have all my migrated Pokemon. Using them in the fourth generation games, I became so used to being able to outspeed and outpunch everything that I never expect to get sweeped out by everything past White Forest. Also, does anyone known where to find the TM for Brick Break in B/W? Also, the details of the Meloetta event have been released. 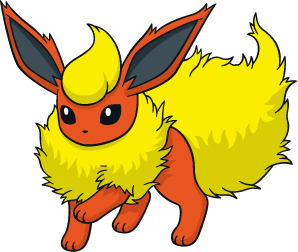 Flareon is a physically-inclined fire type. Its best physical fire move is Fire Fang. Plus, if it's so horrible, why is it so cute? Yeah, I remember reading that Flareon doesn't have a great STAB move that takes the most advantage of its primary attacking stat. But it's still good, right? It's cute and therefore good, just like Sunkern. I wasn't taking a stab at you, I was taking a stab at Sunkern for being deceptively cute. Ding dong! A bit of news. Well, almost news. This picture apparently contains the names, numbers and types of the 6th generation of Pokemon, although not yet absolutely confirmed. The picture is from 4chan. Although pretend it's legitimate, what do you think? We see Sylveon as a normal type, and that the fire starter isn't a fighting type. There are also loads of pre and post evolutions as well. I've also noticed Wastenaut and Garbarge. We have two more garbage Pokemon, people. I suppose if the pre-evolutions to Pinsir and Heracross are revealed around March 15, then this picture is something to go by. Between them is Scimincer, which is most likely a pre-evolution to Scyther. If you ask me, sunkern looks a little creepy. 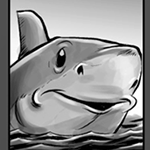 Like, way too suspiciously happy. But then again, every "cute" pokemon looks either "meh" or "you're trying too hard." As for the new pokemon list: Iwish, Clovyr, and Shamroc sound extremely cool with their grass/dragon type and clover motif. If the last evolution is indeed based on the mythological roc as the name implies, then I want one, hands down. Also, Garbarge sounds cool, if it is indeed a barge made out of garbage. Man, I bet these pokemon aren't going to look nearly as cool as their names make them seem. Cocojoe and Cocomando appear to be the very first grass/fire types, and I can only assume that they will be based on hot chocolate. Not sure what to make of that. @Gel: I think Cocojoe and Cocomando are based off coconuts like Exeggcutor but also sport a sort of Tiki-tribal motif. @Frostie: I pretty much beg to differ, there are some subtly cute Pokemon out there, like Sneasel. evolves into a FLYING type?? Yeah, it really looks like it should be grass/ground. It's a mole. Moles don't fly. They aren't planes. Okay, maybe I should explain my reasoning. I rarely find anything cute, something that makes some people go "aww" just make me stare at it and say "meh." Like babies, babies are lower than meh to me. In fact, for me to find something cute, it has to have a distinct personality that I would find amusing. For example, there was a character in one show that was meh at first, but went to a level of 'cute' after getting further into the series. With my spore creatures, everyone finds them cute, I think they're just meh. But this isn't my conscious decision, it's just that way for me. EDIT: nEVERMIND, sneasel is okay. With my Sneasel high wearing off, I'd like to present my team in White after much migrating, TM searching, cheat-renaming, grinding and Elite Four battling. Take it away, myself.